The building of the golf courses must have caused a stir of excitement back then. Winged Foot had sought out the best. A. W. Tillinghast, one of the most prominent golf architects of the day, was hired to build the courses. Also hired was respected clubhouse architect Clifford Wendehack to build a clubhouse in the style of Tudor Scholastic. Shortly after the club opened, Winged Foot appointed top player Mike Brady its pro. Brady finished second in the 1911 and 1919 U.S. Open Championships. The initial charter members came from the NYAC. And we can imagine that informed local golfers were following every stage of the development and walking the grounds surveying the raw layout. Celebrity memberships followed. John Anderson, who had finished second twice in the U.S. Amateur, joined in 1924, shortly after the course was completed. Jess Sweetser, 1922 U.S. Amateur champion and runner-up in 1923, also joined in 1924. Other top golfers in the area migrated from their clubs and sought membership at Winged Foot. The club became recognized nationally when the USGA awarded the 1929 U.S. Open to Winged Foot West. It took only six years for Winged Foot to be selected by the USGA to hold an Open. To this day, Winged Foot West is “the youngest” course in history to be so honored. Winged Foot Golf Club is admired around the world as one of the world’s greatest Golf Clubs. The Founders had such a remarkable vision for the Club which was founded in 1921. Not one, but two of the greatest golf courses in the world designed by A. W. Tillinghast. The Founders wanted two exceptional golf courses, a rather bold undertaking for the times. Starting in 1929, the Club has hosted major golf events. Since their opening, both golf courses have been recognized both individually and collectively. The West Course has consistently ranked in the Golf Digest Top 10 in the United States. Winged Foot Golf Club is the only golf club in the world with both courses ranked in the Top 100 worldwide. Our courses are maintained to meet and exceed championship standards. In 1929 Winged Foot Golf Club hosted its first US Open. Since then the Club has hosted four more USGA National Championships, the 1997 PGA Championship, two Women’s Opens, a Senior Open and two U.S. Amateurs and the 2016 U.S. Amateur Four Ball. In June of 2020 we will host our sixth USGA National Championship. There are few clubs in the world with Winged Foot’s history of hosting major golf events. 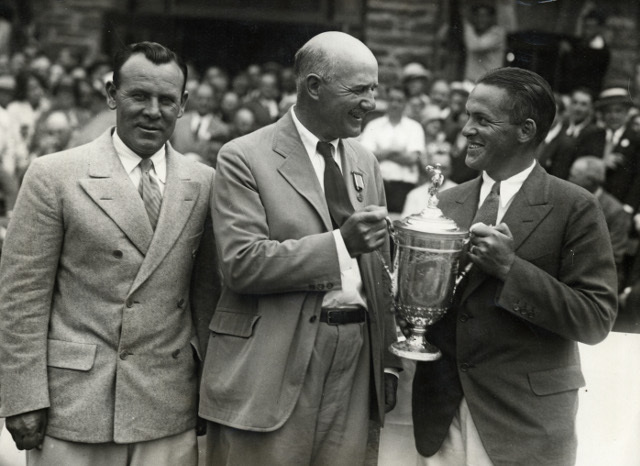 Bobby Jones accepts the trophy from USGA President, Findlay Douglas, after winning the 1929 US Open at Winged Foot. He soundly defeated Al Espinosa (standing on left) in a 36-hole playoff. 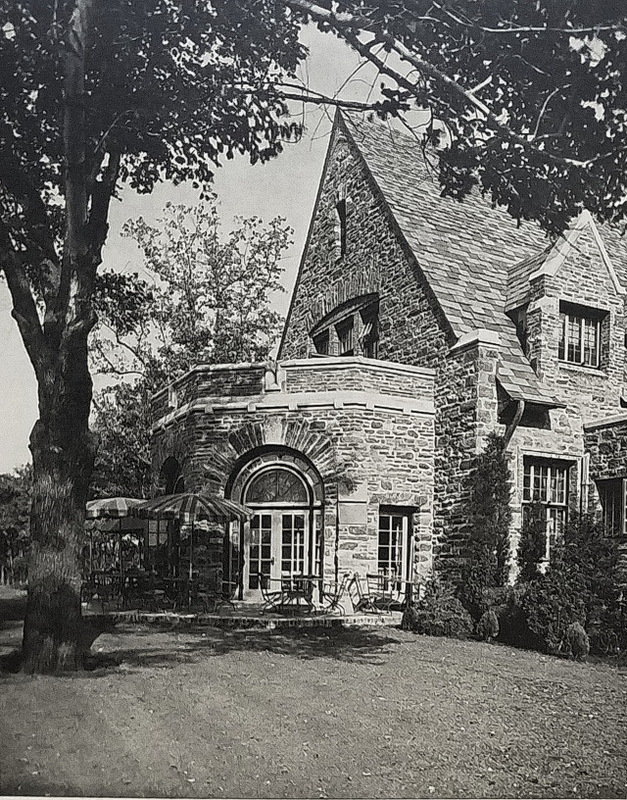 A vintage view of Winged Foot’s iconic clubhouse that was designed by the world-renowned architect, Clifford Wendehack. 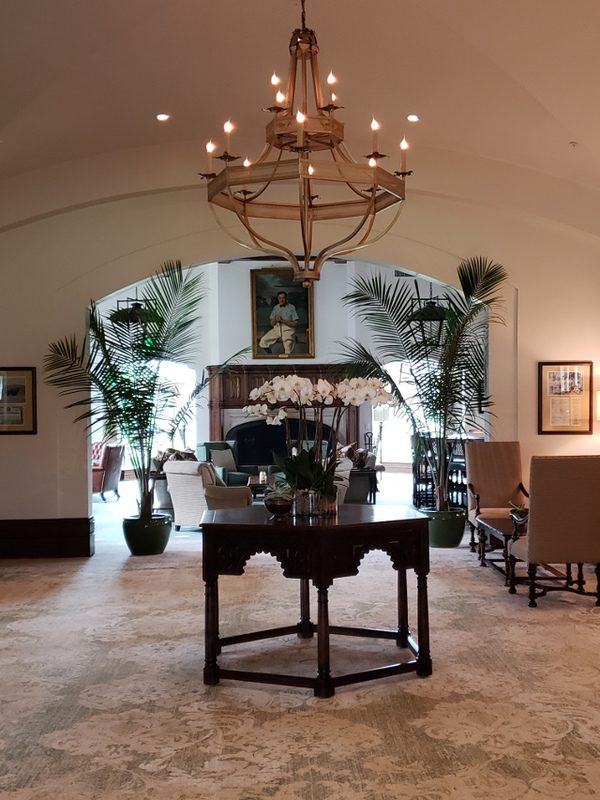 Even today the clubhouse retains all of the classic elements of his design, placing it among the top clubhouses in the world. The victorious US Walker Cup team poses with the sterling silver trophy. The US team defeated Great Britain by a total of 10-2. 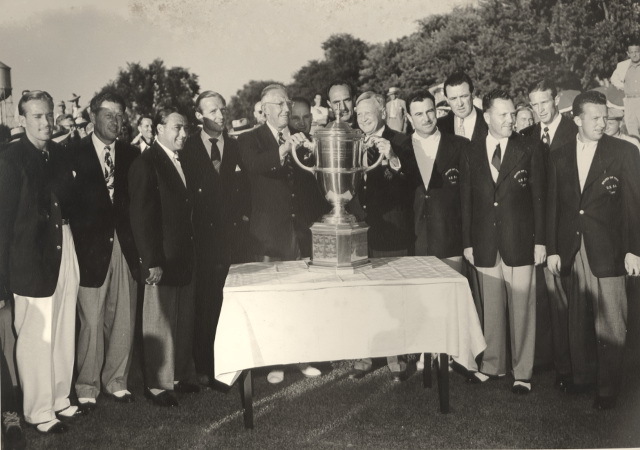 The Cup was presented to US team captain, Francis Ouimet (center left) by USGA President, Fielding Wallace (center right). 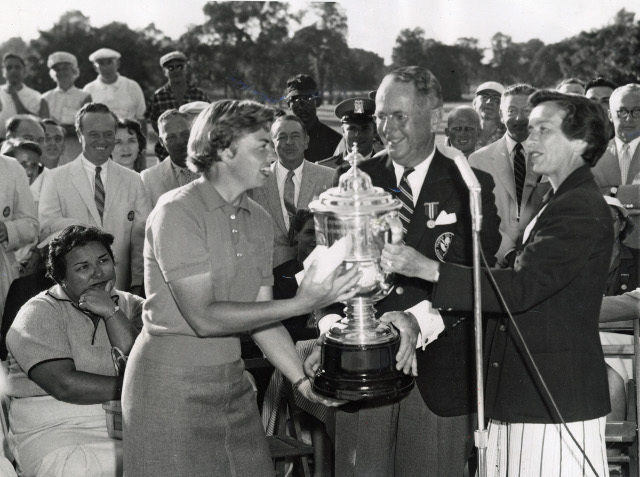 Betsy Rawls accepts the 1957 US Women’s Open trophy from USGA President, Richard Tufts (center) as runner-up Jackie Pung looks on. Pung, the apparent champion, had signed an incorrect scorecard and was disqualified. The fans, officials, and members of Winged Foot took up a collection and presented Pung with over $3,000 (the winner's share was only $1,800). 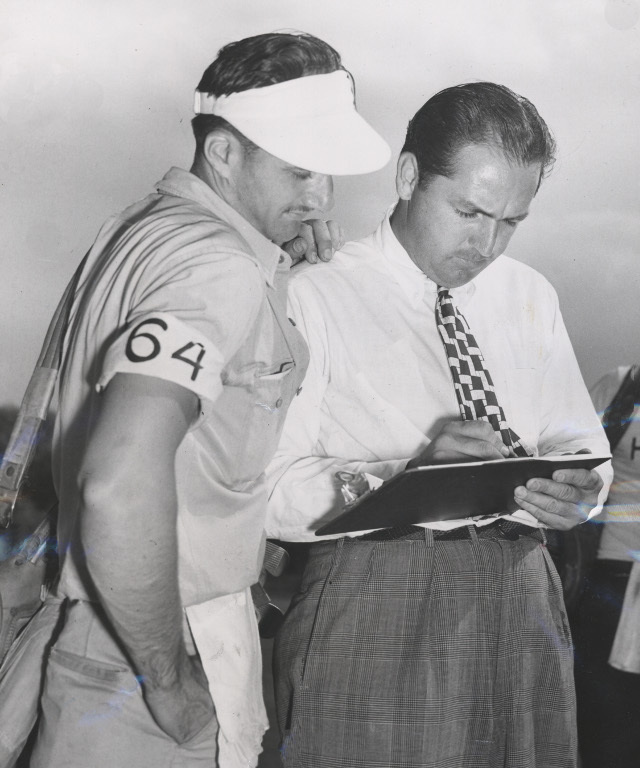 Longtime Winged Foot Head Professional, Claude Harmon, is shown providing direction to one of the club’s caddies. Harmon served the club from 1945 to 1978 and will forever by linked with Winged Foot. 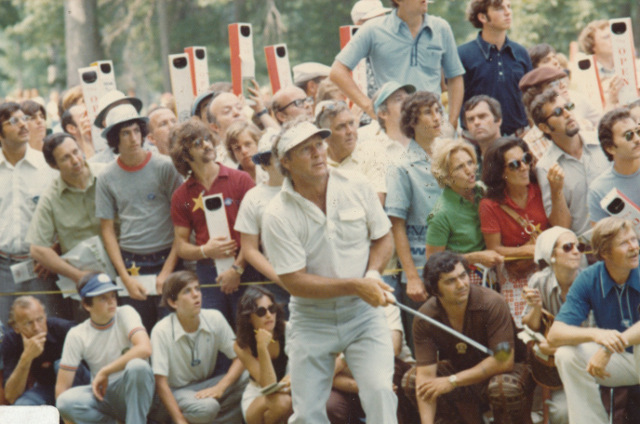 Arnold Palmer, and Honorary Member of Winged Foot, is shown playing in the 1974 US Open. Palmer is surrounded by his legion of adoring fans. Palmer finished T5 behind the eventual champion, Hale Irwin. 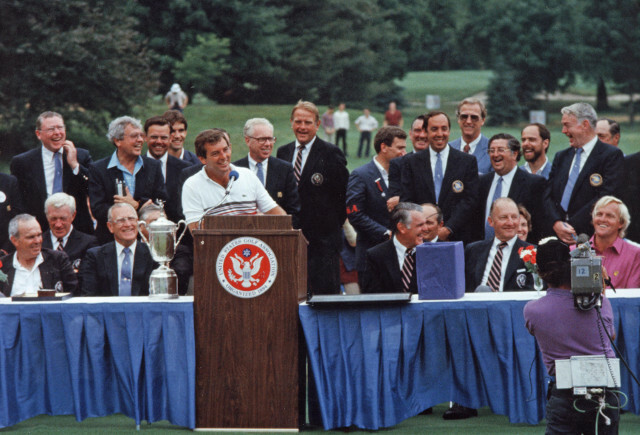 Crowd favorite, Fuzzy Zoeller, accepts the US Open trophy after winning the 1984 championship. Zoeller out-dueled Greg Norman (seated far right) down the stretch to claim his second major. Davis Love celebrates his emotional victory in the 1997 PGA Championship. 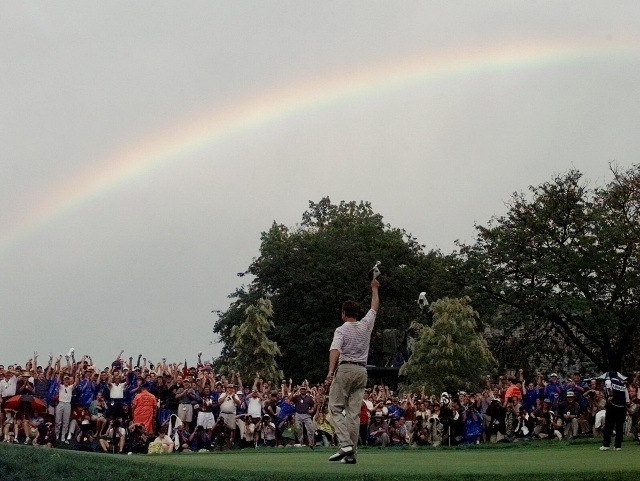 As Love completed his successful final hole, the sun peaked through the rain clouds and a rainbow appeared on queue- which many suggested was the spirit of his late father. 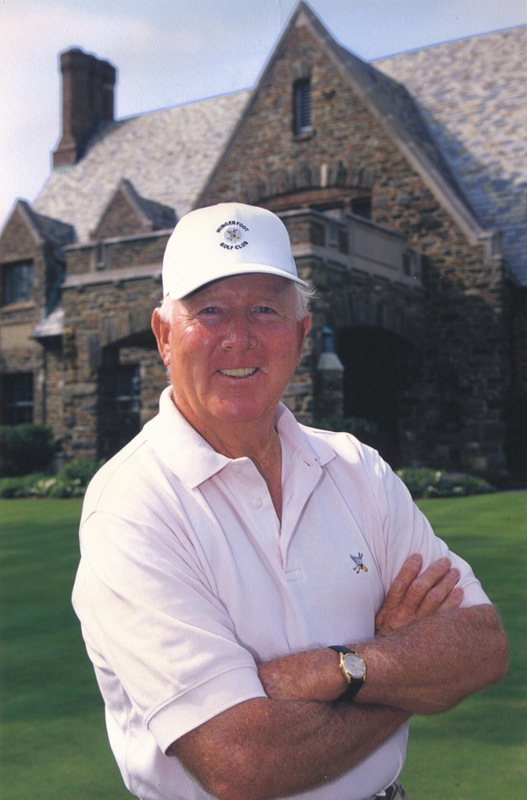 Longtime Head Professional, Tom Nieporte, is shown outside the Winged Foot clubhouse. Nieporte served the club dutifully from 1978 until his retirement in 2006. He was a superb teacher and a fixture at the club decades.